Coat a medium saucepan with the cooking spray/olive oil, place over medium-high heat. Add sausage. Cook according to package directions. Cover pan. Let cook. 5 mins? Add in frnz onions and diced green bell peppers. Cook couple of mins. Having a cast iron skillet is ideal for this, but you can make do with normal skillets just fine. Lightly coat skillet with spray and put on stove at just over medium heat. Place one tortilla in skillet. Add cheese and green onions. Spread out over tortilla. Don’t pile on, you just want enough to make a light covering. Place second tortilla on top. Flip after 2 to 2 1/2 mins. Remove after another 2-2 1/2 mins. Repeat with as many as you need. 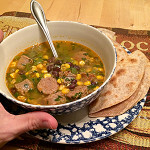 Try to keep qusadillas warm… put on plate and keep in oven until finished making all you need. Remove from oven an cut into quarters. Serve soup into bowls with quesadillas on side.